In previous posts I have described the Teaching With Technology workshop which has been the focus of my Major Digital Project. In this post I intend to highlight the lessons which were learned through the process, and the modifications Leanne Forrest and I plan to make for upcoming sessions. A couple of weeks after the Teaching With Technology Session, we sent participants a follow-up email. In this email we told them we had provided feedback on their blog posts and asked them for session feedback by completing an online survey. Unfortunately, the timing of the survey was close to report card and interview time, so the response rate for the survey was quite low, with only two of the seven participants completing the survey. Listed below are the survey results. Introductions: At the start of our session we introduced ourselves as presenters, but we did not take the time to allow participants to introduce themselves to others and identify their teaching assignment. Fortunately, because of the small group size introductions did naturally occur, and because of this teachers began to network with participants with similar teaching assignments. Networking Opportunities: Teacher feedback indicated they would like more opportunity to network and collaborate with other participants during the project. This might include Skype sessions between classrooms, joint class blogging projects, etc. We plan on encouraging and promoting these ideas in future sessions. Timing: In the future we will avoid offering sessions close to report card season. Commenting: Upcoming session participants will be able to view and comment on blog posts from the first session. We would like to encourage this and plan to build a commenting section into the PD workshop. As in any PD session I have given, there is always room for improvement. Leanne and I plan to reevaluate future sessions and make modifications as suggested by participants. We look forward to collaborating with teachers to create opportunities for teaching with technology in the classroom. build sustainable, personal learning environments and networks. Work in Progress. I am very happy with the progress I have made in this area. I choose to consider this a work in progress because it is something I will continue to build and nurture in my professional life. In our first class Alec made the statement that we as a class would determine our learning experience. What a learning experience it has been! The advancements I have made in the area of social media have occurred because of the collaborative efforts of all of the EC&I 831 community. Thanks to everyone for connecting with me and sharing this experience. I have managed to view a few of the Summary of Learning assignments which have been posted to the blog hub already, and I am impressed. I look forward to viewing all of them as they become available. Embedded below is my Summary of Learning project for EC&I 831. I will be posting my final thoughts on my Major Digital Project later in the week. As part of the Networked Professional Learning assignment for my EC&I 831 course, my professor, Alec Couros, challenged participants to develop a "personal learning network" through continuous participation with a wide variety of social media tools. As a summary of our growth, we were asked to consider the question: "How have you become a more networked professional?" I decided to base my response on the concept of "The Networked Teacher" diagram Alec shared with us during one of our sessions. In my infographic I have highlighted the thirteen components of connected learning in which I experienced significant growth. For each of these components I have provided links (dots) to examples of tools which helped me become a more connected teacher. In addition, for each component I have provided a video explanation (black play button) outlining how that component allowed me to become a more connected educator, and what I learned in the process. I have decided to post this Thinglink as part of my Summary of Learning because it outlines the growth and learning I experienced in my attempts to become a more connected educator. I began by exploring a number of different infographic creation sites. None of the ones I looked at suited my needs, so I decided to build my own in a low-tech way. I built the infographic using MimioStudio Notebook software (similar to SMART Notebook). I probably could have done the same thing with PowerPoint, Paint, or Photoshop. Once all of my images were in place, I saved the slide as a .jpg and uploaded it to Thinglink. Next, in Thinglink I created links for every icon I had included in my diagram. When possible, I linked directly to my account for the web service or tool. Finally, I gathered "evidence" of my growth for each component through screen clippings and screen recordings. I loaded these clips into iMovie and added voice narration to explain my growth. I uploaded these to my YouTube account and then linked these to my Thinglink image. I would definitely consider doing a project such as this with students in the classroom. How might you use Thinglink? How is your growth as a connected educator similar or different to me? Explore, plan and implement a technology tool to support an instructional strategy or outcome. The model will support selecting, evaluating, and reflecting on the teacher’s plan. Share the successes, challenges, and implementation of the strategy or additional technology integration as a community of learners through a series of blog posts and reflections. Our hope was to make the learning process of the teacher participants visible, and to provide a supportive collaboration space for teachers to share their project experience. Our division made an upgrade to Moodle over the summer, so in our planning we decided we wanted to try out some of the Moodle blogging features. In planning the session we began by creating a Teaching with Technology section on our Moodle site. We then enabled the blog block for the Teaching with Technology course. During our session we introduced the teachers to the SECTIONS model for evaluating technology tools. The sections model is divided into four parts: Define, Assess, Implement, and Refine. Our plan is to have teachers submit a blog post for each of these four parts as they work through their project. Teachers were also asked to attach the Assess Checklist document to the first post. The Assess Checklist document was the checklist teachers used based on the SECTIONS model to evaluate their chosen technology tool. Displayed below are a couple of examples of initial blog entries made by participants. Leanne and I have begun the dialogue in this area by commenting on participants' first blog posts. We plan to encourage teachers to support each other in this space by viewing and commenting on the posts of other participants. Participants in future sessions will also get the opportunity to view and comment on all participating teacher posts. It is our hope that this will encourage sharing of ideas between teachers and help in our development of a technology fair. A couple of highlights for me from this week involved my work in classrooms. 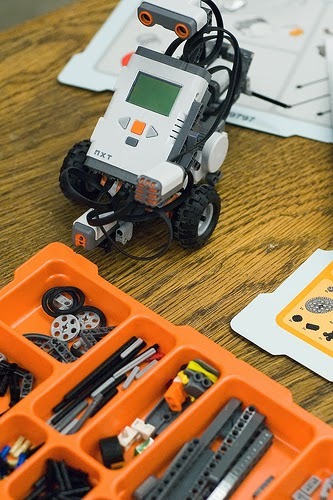 Over the past 5 years I have provided the 1/2 day robotics session for about 50 different classrooms. It is always a great time, with students begging to stay in at recess to keep working on their creations. Having read "Invent to Learn", by Sylvia Martinez, I now feel that I have some of the theory to back the practice of project based learning. A second highlight occurred today as I was leaving church. I have been helping a group of Gr 8 students prepare book trailers based on Willow Award books. The next step involves uploading the trailers to YouTube and then creating QR codes for each book trailer so that students can easily access the book trailers by scanning the QR code with their smartphone. On my way out the door a student from the class approached me and asked when I would be coming back to help him to get started with the upload and QR code creation process. When I told him I wouldn't be out until Thursday he was a bit disappointed because he is excited to get going on this part of the project. It is always encouraging to see that students are engaged in learning. For EC&I 831 I have made some great headway on all three assignments. I remain an active participant on Google+, Twitter, and the Blog Hub. I continue to slowly grow my PLN. This week I created a couple of posts for my Major Digital Project and also tried to include a couple of more personal posts. I have begun putting together an infographic as part of my final explanation of how I have become a more connected educator. I am using new (to me) tools like ThingLink, Voki, and Wideo to explain my growth in this area. I have begun organizing my thoughts for my Summary of Learning assignment. In order to make my learning visible, I am in the process of creating a LiveBinder as a way to summarize many of the key concepts I have learned through this course. My Major Digital Project is also coming along nicely. Over the next two weeks I plan to outline two final components of the project and identify some of the modifications and adaptations I will make to future PD sessions. EC&I 831 has been great! I can't believe how much we have covered in such a short time. The variety of topics we have explored these past couple of months has been incredible. All of the great references to web tools, resources, articles, videos, blogs, etc. has at times been a bit overwhelming. In beginning to think about my Summary of Learning project I decided I needed a way to organize all of these resources in one place. Below is a link to a LiveBinder I have created for the EC&I 831 class. I have tried to divide it into subsections based on class sessions. I have also included sections related to my Major Digital Project, Networked Professional Learning and Summary of Learning projects, as well as a section with a number of articles recommended by classmates on Google+ over the course of the semester. In each subsection I have included links to related articles, suggested readings, web links, etc. which were mentioned by each presenter. I have also begun jotting down some of my brief personal reflections for many of these resources in the binder as well. This is very much a work in progress, and is in no way completely comprehensive, but if you need quick access to resources discussed in class please feel free to take a look.